A young, brash Emperor wishes to be like the heroes of old. He lacks patience, guidance, and wisdom. In the night he is visited by dreams, and nightmares whose meaning he can’t decipher, but he is compelled to follow his interpretation of them. Dreams of Hegemony is a story of having to trust people you don’t like or understand for a chance at a better tomorrow. Ultimately it is about love. The love one has for their country, friends, and family. And sacrifice. Will the brash Emperor be able to work decipher these dreams towards a better future? To unfold the challenges faced in the ‘Dreams of Hegemony’, I’ve been joined by author Christopher Reamy. Christopher, thanks for spending time with me today to do a little divination on these dreams. Let’s start the divination at its source. How did the first dreamy wisps of this novel, appear? I had just left the movie theater with my friend and I told him that I was tired of stories that were too conventional. I didn’t like the way there seemed to be little to no consequences in many tales. I told him that I wanted to write a book that expressed consequences, and twists, something that I would love to see or read. The first thought in my head was the first few paragraphs of the opening chapter, a vision of a large powerful young ruler sitting on a throne, who outwardly was rich and intimidating, but inwardly was destitute and weak. It sounds like those initial ideas came quite quickly. Did you pull things from your own life to generate get the ball rolling rapidly, or did you feel that events in your life supported later elements of the tale? The first thoughts for this book began while I was deployed in Iraq and Afghanistan. I wanted to tell a story…a realistic story in a fantastic setting surrounding a diverse group of characters with different personalities, flaws, religions, and thinking processes. One about a very flawed man who loved his kingdom. A man who, in many ways, was incomplete, shallow, and hollow. Many aspects of this book were loosely taken, or directly taken from similar personal instances or situations that I witnessed or have been involved with in my life/military career. Sadness is real. Loss of life is real. Bigotry is real. But so is love. And it is this combination that makes us human, interesting, and ultimately fascinating. Humanity is fascinating. How did you go about striking the right note of human complexity? Did you heavily borrow people from your own life during character formation, or did you find it more freeing to use purely fiction people? I based virtually all of my characters on actual people that I knew. Some were exaggerated versions, while others were pretty spot on. That was part of the fun of writing this book. I was able to create this very fictitious world from the real one. I think secretly that is what most artists, writers, musicians, desire most. It is the ability to develop, mould, alter, and create. To show people your mind, your heart. Everything I write I see in my head. I can’t draw to save my life, but I see perfectly in my mind and write what I see. I think that is why so many have told me that my book reads like a movie. I see it all in my mind and try in great detail to capture it on paper. What was the most important thing you wanted to capture in detail? I wanted to put true humanity on display. I wanted to express what it really is…how complex it is…how complex WE are. I wanted a powerful protagonist that was at the same time, vulnerable, and afraid. Afraid that he was inadequate…That he wasn’t good enough…That he didn’t measure up to his forefathers. The book is violent because the world is violent. But ultimately, at the heart of it is love, because anything worth loving is worth fighting for. The world is violent, I like to keep my mind on the heart and love. So, tell us, what did you love most about writing this book? Being able to express myself and share my vision with the world. I told my wife, that if I was to die before my book was published, that she would have to publish it in my name. It was that important to me. I’m not joking. There were times when I was flying into combat zones and one of the thoughts going on in my mind were, “If I die today, my book is only saved on this desktop. No one will ever get to read it.” Of course, I wasn’t married at the time, so my priorities were very different. Well, I’m glad that you lived to see your book touch the shelves! Going back to the idea of changing priorities and life lessons, what did you feel that you learnt by putting your novel as a solid priority in your life? Being patient. Understanding that nothing happens overnight. *Laughs* Patience is a tricky one to master. I wish I had a good handle on it every day! But despite your challenges with patience, you’ve managed to continuously put one foot in front of each other until this book was completed. Have you started putting your feet in front of each other on a new writing journey, now that this one is complete? I have actually finished about half of the second book in the series, but it will probably not be my next release. I have a realistic fiction/dystopian tale set in modern day. The ending came to me first on that one, before anything else, and I just thought to myself, “WOW! This would be crazy!” So I began feverishly writing the book. Unlike “Dreams of Hegemony”, everything has already been decided and jotted out for each chapter beforehand. The only thing left is just filling in the blanks. Writing is so much easier when you’re just filling in the blanks! Was ‘Dreams of Hegemony’ written in the same way, or was the ending something that became clearer as the words or outlines started to form? I did not know with “Dreams of Hegemony” I only had the characters in mind. But going forward I have laid out the story much more intricately and with great detail. But that was also a big plus, in my opinion, for “Dreams of Hegemony” because the dreams and story were unraveling for me just as it was for the reader. There were two different endings I had for the book, but ultimately enjoyed the final cut that is in the book now a little more. What do you love most about the written word and the act of writing? What continues to draw you back to these fictional dreams? Because I love it. Because I can not be satisfied keeping my ideas and visions in my head. It would be a total waste to write something, or draw something, and put in on your desk and lock it up so no one can see it. I would rather earn $0 dollars and have the entire world read my books, than gain 1 million dollars and lock them up for my eyes only. I want to hear, see, experience other people enjoying my books and ideas. Nothing is more fulfilling than that. Is that drive to see other people enjoying your books what you hold in your mind while you write? It’s good dialogue mostly. I really enjoy writing conversations. I think that is what I am best at. I love quiet conversations between people. I love getting to know characters and how they think..their motivations. The most entertaining parts of most movies are insightful exposition about the characters. If all you have are explosions and battle scenes no one is going to care. You have to care about the people first. And you do that by having good, true, and honest dialogue. That character exposition is so incredibly important, and something that I feel is sometimes lost in today’s world, but I’m very glad to hear that you’re keeping the importance of honest dialogue alive. How do you technically approach getting the best dialogue on the page? Are you a big believer in things like writing goals to make sure you’re making headway? I have heard a LOT of people talk about writing every day. I have heard many people talk about a page count. However, for me, I write when I have something to say. An idea. A vision. If I don’t, I don’t write. I am a very cut-and-dry upfront person. And I’m not always the most patient person in the world, so just like in my writing, you can tell there are not a lot of empty chapters where nothing happens or long strings of pages where I go on and on about one thing that really has little impact or merit on the story. I enjoy a fast-paced story, and I don’t like to write for the sake of word count. But, I do admit, just like lifting weights, you don’t get stronger by NOT doing it, either. As there aren’t many superfluous words in your writing, do you feel that the overall product is still enhanced by editing? I have learned the hard way, the more eyes you get on the “finished” product, the better. Editors are great, but they can only do so much, and they are not perfect either. You read your book all the time. You have gone through each chapter incessantly. But the bad part about that is, after a while, your eyes get used to the words and stop reading and breaking down each sentence, and begin skimming. Get your book into as many hands as you feel reasonable, after the editing process to ensure the highest quality book you can get. Good questions get brought up from people that you may not have thought of. Sometimes you may be a little repetitive and didn’t notice. It’s good to be thorough. Has the practice of editing your own work to remove things like repetition helped your author voice progress? Yes, you refine your skill. You learn your weaknesses and strengths. And if you are smart you begin to work on your weaknesses and learn to not rely on your strengths so much to tell a good story. A great fastball is awesome, but if that’s all you have, people will start to make contact on your pitches, and you will soon be out of the game. Learn the “curveball”, mix things up, improve your technique, and success will follow. When you consider your writing technique, have you turned your thoughts towards creating an author brand to support your unique voice? I am the last person who would think about branding. However, it is a necessity nowadays in the world that we live in. I didn’t even have a twitter account until recently. I’m a relatively young man with an older soul, but I have had to learn to get with the times. I really enjoy talking about writing and have wanted to create a blog, or a video blog to discuss many topics surrounding writing. I am a very passionate person when it comes to my interests, and I can talk for days about a given topic that interests me. Self-publishing is obviously something that interests you as you’ve taken the journey there once, and are planning on returning at least twice. What do you feel other authors should be doing to ignite their self-publishing passion? Have friends. Have a blog, video blog, twitter, if necessary, a website, and once again, friends. Preferably friends who like your genre of writing. It is very hard to get the word out when you are self-published. I wish nothing but the best for aspiring authors. Aspiring authors do have a long road ahead, but having friends in the industry makes it so much more fun! And I really believe that the author journey should be all about fun, which is why I like to pepper my author interviews with a few random quirky quick-fire questions like, what is your zodiac sign? Does he have fur or scales? Cause I’m not sure how cuddy the Dogan would be with scales. What’s your favourite word? And to wrap our up passionate discussion on the ‘Dreams of Hegemony’, can you share the most passion filled line to stoke fire in the hearts of readers and encourage them to pick up your novel. Make not this era a collection of burdensome years. Is not the weight of the crown sufficient enough, that you must compress it further with each brick of anger? Well, I hope that our young Emperor friend can move past his anger into happiness. Christopher, thanks for chatting with me today, and I wish you the best of luck on the sequel. Excited to read the book we discussed today? Find it here on Amazon: ‘Dreams of Hegemony ( ASIN: B075CTSVHM )‘. 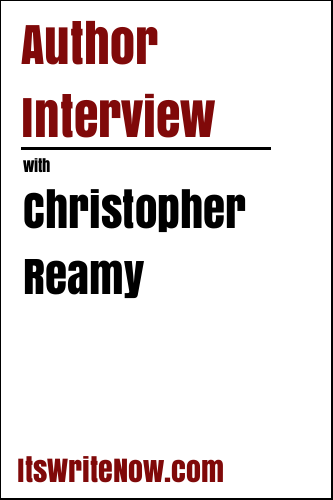 Want to find out more about Christopher Reamy? Connect here!